The introduction and spread of non-native aquatic species in Michigan’s surface waters is an issue of great concern, both environmentally and economically. Over 180 non-native aquatic species have been documented in the Great Lakes, many of which have become so prolific and problematic that they have been labeled “aquatic invasive species”. These invasive species have myriad negative impacts on Michigan’s aquatic ecosystems, including the displacement or loss of native aquatic organisms, alterations in the food web and nutrient cycling, and water quality degradation. Annual economic costs associated with aquatic invasive species are estimated to be in the range of $200 million dollars for the Great Lakes region alone (Lodge 2008). These costs are attributed to aquatic invasive species impacts that negatively affect commercial and sports fisheries, raw water use, and wildlife viewing. Several of the most problematic aquatic invasive species have only recently appeared in or near the Elk River Chain of Lakes (ERCOL) Watershed. Invasive Phragmites, a tall perennial grass that dominates wet areas, has started to appear on Lake Michigan shoreline in areas adjacent to the ERCOL, but thus far, it has not been found in any of the water bodies of the ERCOL. Purple loosestrife, another invasive plant inhabiting and dominating wet areas, has become established in some areas of the ERCOL, but not too populous to feasibly control. Eurasian watermilfoil and curly-leaf pondweed, submergent invasive aquatic plants that grow very densely and outcompete natives, are present in the ERCOL Watershed, but both are still quite limited in distribution. Zebra mussels have invaded most water bodies in the ERCOL, but quagga mussels remain held at bay and have not yet been found in the ERCOL. Other aquatic invasive species considered imminent threats to the ERCOL Watershed because they are found in or near Michigan include starry stonewort, European frog-bit, water hyacinth, water lettuce, Brazilian water-weed, flowering rush, parrot-feather watermilfoil, and hydrilla. Monitor the spread of specific types of invasive species in the watershed (i.e., purple loosestrife, Eurasian watermilfoil, zebra mussels). To ensure rapid response, the Watershed Council shares all invasives species detection information with relevant organizations, agencies, and individuals. These include stakeholders from throughout the watershed where detected, as well as regional organizations and agencies involved with water resource management. At a minimum, all invasive species data from the Elk River Chain of Lakes will be provided to the Michigan Department of Environmental Quality (MDEQ), Michigan Department of Natural Resources (MDNR), Michigan Natural Features Inventory (MNFI), and Midwest Invasive Species Information Network (MISIN). Goal 1: Survey all major water bodies in the ERCOL Watershed to document locations and characteristics of the five aquatic invasive species of concern (Phragmites, purple loosestrife, Eurasian watermilfoil, curly-leaf pondweed, quagga mussels), as well as other aquatic invasive species considered threats to the Watershed. Objective 1: Train project partners to identify aquatic invasive species of concern and to properly and thoroughly document invasive species occurrence. Objective 2: Survey the shorelines of the fourteen major lakes and connecting tributaries to document the occurrence and extent of invasive riparian ore emergent plant species, including invasive Phragmites and purple loosestrife. Objective 3: Perform visual surveys of the fourteen major lakes and connecting tributaries to document the presence of invasive submergent plant species, with a particular focus on Eurasian watermilfoil and curly-leaf pondweed. Objective 4: Intensively survey the plant populations of four lakes of concern (Intermediate, Hanley, Elk, and Skegemog) to comprehensively document plant species, communities, and densities, with a focus on Eurasian watermilfoil, curly-leaf pondweed, and invasive plant species currently considered as threats. Objective 5: Survey the benthic zone of all major lakes and connecting tributaries in the ERCOL using a benthic sled to detect invasive quagga mussels. Goal 2: Disseminate project findings to watershed stakeholders, other appropriate organizations and agencies, and the public to increase awareness of aquatic invasive species and status of invasives in the ERCOL Watershed. Objective 1: Compile all data gathered from the project, as well as any additional aquatic invasive species information available for the Watershed, and write a summary report. Objective 2: Share project findings with Watershed residents and the public in general by making summary report and data available on project partners’ web sites and by including summary articles in partners’ newsletters. Objective 3: Present project findings and provide summary report and project data to the ERCOL Watershed Planning Committee (Committee). Objective 4: Provide summary report and project data to relevant water resource management organizations and agencies, including MDEQ, MDNR, MNFI, and MISIN. Goal 3: Encourage action by Watershed partners and others to manage and control the spread of invasive species in the Watershed. Objective 1: Work with the Committee to plan and implement invasive species management and control strategies. Objective 2: Encourage state agencies and other organizations to assist the Committee with planning and implementing invasive species management and control strategies. The Watershed Council will rely upon its staff members’ extensive invasives monitoring and control experience, as well as in-depth knowledge of the project area, to accomplish the first goal and related objectives. The Watershed Council’s intimate involvement with the Committee, co-chairing Committee meetings and collaborating extensively with project partners, will help accomplish the goals two and three. Project partners have repeatedly demonstrated initiative and willingness to assist with invasive species management and will help accomplish project goals and objectives by assisting with inventories in terms of providing equipment, expertise, and volunteer help, as well as assisting with dissemination of project results and with follow-up in terms of invasive species management and control. Currently, a few lake associations in the Chain are involved with controlling invasive species in their lakes, primarily Eurasian watermilfoil. This project will provide additional information regarding invasive species of concern in these infested lakes, as well as provide information about other invasive species found, which will facilitate rapid response and improve success of management and control efforts. A summary report about the ERISMP that includes findings will be provided to the Committee, local officials, MDEQ, and other relevant stakeholders. All data from the project will be provided to MDEQ and interested watershed stakeholders. The summary report and data will be made available to the public via the Watershed Council web site. The ERISMP will be carried out on 14 lakes, as well as connecting water bodies (streams). Maps and location, area, and shoreline information for the water bodies to be monitored are included in Table 1 and Figure 1. The total shoreline length that will be surveyed for Phragmites, purple loosestrife and other invasive riparian plants is 192 miles. The total lake area to be visually surveyed for invasive submergent species is 21, 798 acres. Comprehensive detailed submergent aquatic plant surveys documenting plant species, communities, and densities will be conducted on four lakes (Hanley, Intermediate, Skegemog, and Elk) totaling 12,620 acres. Based on similar aquatic plant surveys, an estimated 1500 sites will be sampled on these four lakes. Each water body will be monitored only once during the course of the project. Due to the magnitude of the proposed project, two years are required to accomplish goals and objectives. We intend to complete all monitoring components in the Upper Chain (from Beals Lake through Intermediate Lake) during the first year of the project and finish the Lower Chain monitoring (Lake Bellaire to Elk Lake) during the second year. If field schedules allow, additional lakes will be surveyed during the first year to ensure timely project completion. Table 1. Water bodies and information for the ERISMP. Figure 1. Water bodies to be surveyed in the ERCOL Watershed. Regarding past invasive species monitoring efforts, little has been done in the ERCOL Watershed and only recently. After becoming aware of a few Eurasian watermilfoil infestations in Torch Lake, volunteers from the Three Lakes Association performed limited surveys in 2012 on Lake Bellaire, Clam Lake and Torch Lake to search for additional infestations. Eurasian watermilfoil control efforts in Torch Lake consisted of diver dredging (suction harvesting). Watershed Council staff discovered Eurasian watermilfoil on Sixmile Lake while on the lake in 2008 and the Six Mile Lake Association has since worked with EnviroScience, Inc. to assess the infestations with surveys and implement biological control by stocking weevils. Land cover data from 2001 show that the ERCOL Watershed is dominated by natural types, primarily forest, grassland, and water (Table 2). Agriculture land cover accounts for approximately 15% in the watershed. 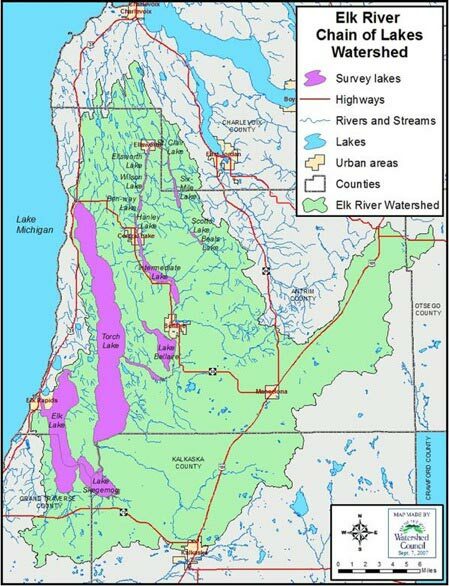 Urban land cover accounts for less than 3% of the watershed and includes the communities of Ellsworth, Central Lake, Bellaire, and Elk Rapids. Table 2. Land cover in the ERCOL Watershed, 2001.